A few years ago Jason better known as Fluency MC, came up with a rap song and a video. In this video he teaches ten phrasal verbs. And as I like the video very much and I think it is really useful, I decided to create a post using the video. In this post you will find the rap song, an infographic and a game to practise and learn the phrasal verbs. Play the following video for your students and let them sing along. 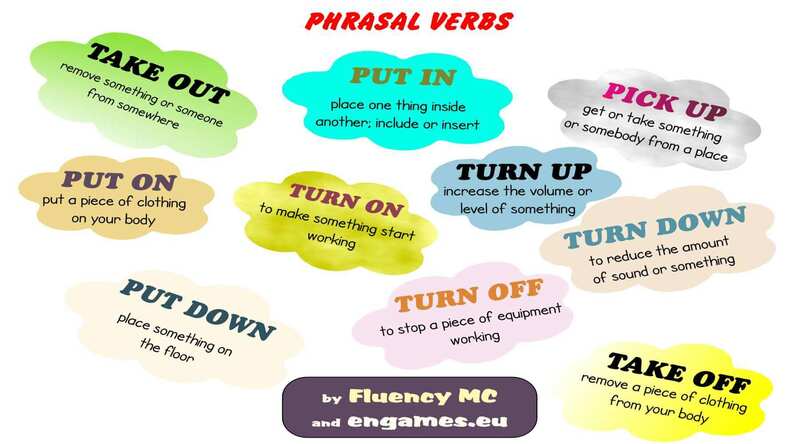 a) Ask your students to write down all the phrasal verbs they hear. b) Ask your students to count the number of phrasal verbs they hear. If you teach a monolingual group and you speak their language, elicit the translations of the phrasal verbs. If you cannot translate the words, ask the students to demonstrate the meanings. All the verbs in the video are easy to demonstrate, therefore once your students finish studying the verbs, practise them using TPT. First, say the phrasal verb in English and students have to demonstrate it. Second, demonstrate and students have to say the phrasal verb in English. The game is called Darts Quiz Game. Your task is to type the correct answer – the appropriate phrasal verb – and then stop the dart in such a place to get as many points as possible. You can buy and edit the game here.